In these difficult times, hope is hard to muster. Based upon a Son Jarocho tune (Son Jarocho was denounced to the Inquisition in the 1700’s for promoting impure behavior). The classic tune took on the Church with humor; Las Cafeteras update the lyrics to support immigration reform. “Verde que te quiero verde” by Ketama, words by Federico García Lorca, one of Spain’s most important poets; assassinated by Franquista soldiers in 1939 at the beginning of the Civil War. Franco’s dictatorship ended with his death in 1975 and Spain made a peaceful transition to democracy. 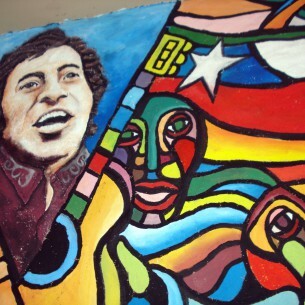 Jara was a Chilean poet, singer/songwriter and activist. After the dictatorship lost its 17-year grip on Chile, Jara’s name was given to the stadium in which he was murdered in 1971. The great Argentinean singer Mercedes Sosa returned triumphant to her homeland after living years of exile during the dictatorship. Guthrie’s words, which he accompanied by his guitar, a “machine that killed fascists” ring truer than ever in this version by Chicago’s own Sones de Mexico. Check Catalina’s Beat Latino for a weekly exploration of the past, present and future of Latin music.